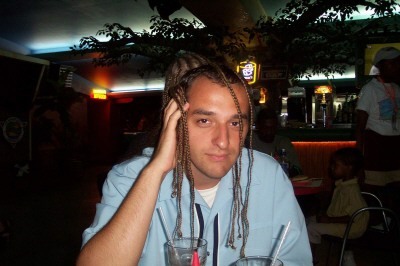 So, Dan Ponjican, what was it like to have real dreads? Did it hurt when you had the braids put in your hair? What did your wife think of your new hairstyle? She was ready to take it out as soon as she got home. I'm just a little (used to be skinny) NJ boy who barely slipped by with getting a BSME degree...wanting to do something for God. What is one thing that you would like to be doing in 6 months that you are not doing right now? I would like to be driving a turbo charged 2002 yellow mustang GT. If you were a flower, what flower would you want to be, and why? I would be a red rose, so that I can give myself to my wife. Daniel is the love of my life. I look up to and respect him as my husband and my closest friend. I am so thankful, Daniel, for the love that you have shown me. God blessed me beyond what I could ever imagine when he brought you into my life. You are truly a prize that I have won! I will never forget the vision God gave to me about the anointing that has been placed upon you to minister. I know that God has something powerful in store for you! I am so excited to see how our future will unfold ~ together in His kingdom.